Vault past the popular concept of a single search bar and get faster results by using X1's refine columns. Evolve your searches as you simultaneously apply multiple criteria using X1's refine columns and preview pane, filtering and redefining as you go, drilling down to your desired result faster. The benefits of virtual desktop infrastructures (VDI) are clear - enabling secure and efficient BYOD, streamlining IT administration, and reducing operational costs. Key to any VDI deployment is end-user satisfaction and adoption. Because best practice dictates disabling Windows indexing to ensure optimal resource performance, end-users tend to be frustrated by poor search experiences. With X1 Search Virtual Edition™, it is possible to provide an excellent end-user search experience while deploying VDI in a way that conserves virtual computing resources. It creates a win-win solution because both IT and end-users are happy. As a result, VDI deployments gain traction and breadth. That is why Gartner says, "Budget for a product like X1 to provide search capabilities to improve the virtual desktop infrastructure (VDI) user experience" in the April 2, 2015 report Cool Vendors in Endpoint Computing, 2015. Hear Citrix and X1 search experts discuss how to harness the benefits of VDI while maintaining and improving end-user productivity. 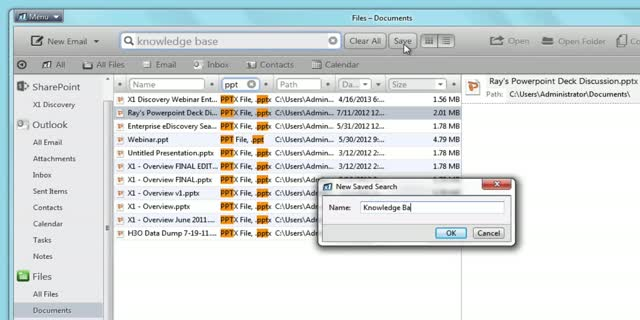 Maximize your SharePoint experience with X1 Search. Watch this video to see the significant advantages of X1’s best-in-market SharePoint search over native SharePoint search for SharePoint 2013, 2010, and 2007, along with SharePoint online. Watch this video to learn how to sift through tens of thousands of emails with just a few keystrokes. Find emails, files & SharePoint data fast! Take a tour of the latest version of X1's award winning desktop search and productivity application. Stop searching, and start finding.